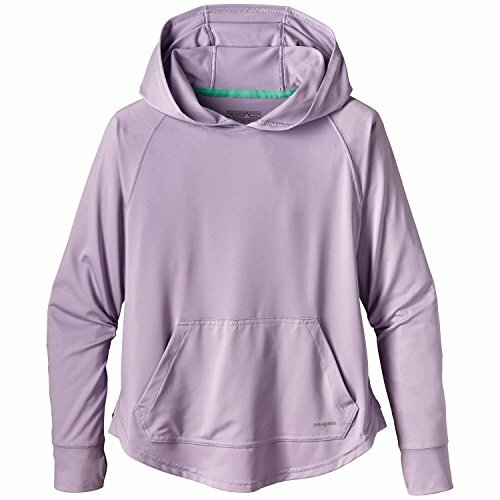 We've made the high-performance Girls' Capilene® Silkweight Sun Hoody for water girls who take dory rowing and buoy paddles seriously. Made of cool-wearing polyester (35% recycled)/spandex jersey blend with 50+ UPF sun protection and Polygiene® permanent odor control. 3-panel hood provides shelter from sun and wind. Raglan sleeves for maximum mobility during smashball volleys. Kangaroo-style pocket stashes sea glass and shells. Cuff sleeves with thumbholes extend coverage. Front and back scooped hem with side inset detail for added comfort. Fair Trade CertifiedTM sewing.